Remove tough outside layer of lemon grass, topped and tailed. Then slice very fine crosswise. Remove stalk and seeds from dried chillies, soak in warm water. After soaking cut into chunks. Remove stalk and seeds from fresh chillies, cut into chunks. Mix all ingredients except sugar and tamarind in a food processor till smooth. 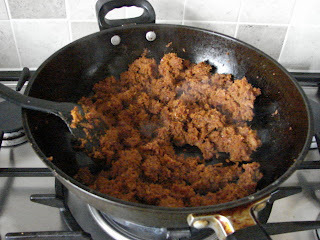 Heat oil in pan, fry the paste with sugar and tamarind juice (to taste). Cook at medium low heat for about 15 -20 minutes till fragrant. Leave to cool. b. This sambal is also great just with rice. c. Use this to stir fry snake beans or water spinach (kangkong) etc.